Mines around the world get the maximum ROI out of their drone operations with Propeller. Reduce cost and streamline workflows with its reliable data processing, intuitive design, and accurate progress tracking tools. The Propeller Platform improves mine efficiency and enables better collaboration, while reducing cost and safety risks. Accessible from your web browser, you can measure stockpile volumes, check road grades, generate topo maps, and track progress against design in minutes. And, with our AeroPoints, easily establish accurate, reliable ground control. Upload design surfaces to visually track progress against your 3D site survey and see how far you’ve got to go. Compare one survey to another to see changes over time. Spot nonconformance issues before they become expensive. Forget sending someone out to walk a pile. Measure your volumes in seconds on the Propeller Platform. Shave hours off your workflow and get better estimates on your inventory. Make huge write-offs a thing of the past. Fly as often as you need. Complete site surveys in hours instead of days. Get your results in 24 hours. Use Propeller to plan blasting and extraction and monitor haul roads with easy-to-use measurement tools and 3D visuals. 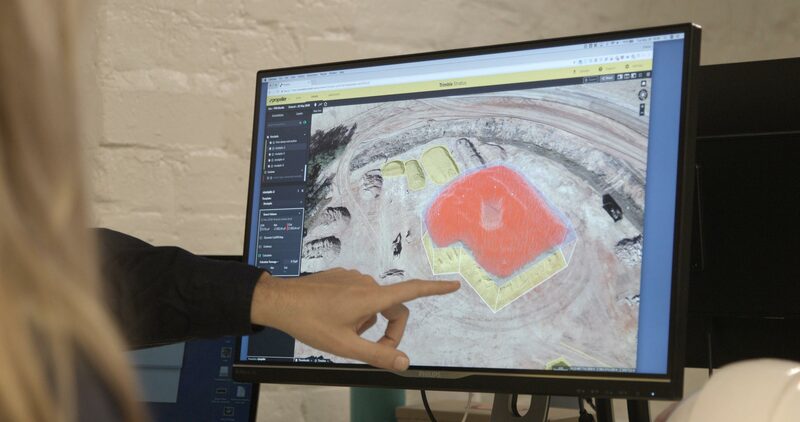 Learn how Propeller’s drone data analytics solutions can streamline workflows to save time and money by closing the information gap between you and your mine. Ever wonder how drones measure stockpile volumes? Learn how drone photogrammetry can help you affordably survey and measure stockpiles faster and just as accurately as traditional surveying.